First of all thank you very much for this aircraft. It is absolutely fantastic. I have just downloaded the latest version 031813 and have found an issue with the TFR. I can't get it to fly any other altitude apart from 200 feet that it defaults to when you initially load the aircraft. On the previous version if you had the TFR engaged and you tried to adjust the altitude with the button under the altitude tape, it would disengage and you would have to push the T key to reengage and fly the new altitude you had just selected. It no longer disengages when you do this action and continues to fly at 200 feet despite what you altitude you have now selected. These changes have been noted in the the Documents/F-111 Panel.htm but have not been noted in the "Autopilot" operation as changes/upgrades are being made nearly daily. I hope this can clarify the operation for your next virtual mission. Thank you for all the info. This thing is just getting better and better. As you know I have the latest version including the new configurator V2.0. When I initially ran the configurator it gave me engine options for each particular aircraft. In my case I selected the F111G model of the RAAF. Now when I open the configurator it starts in the windows task bar and no matter how many times I click or right click, I can't open it to select a different model aircraft. Consquently when I'm in the game and select an F111F for example, a red text indicates I have the wrong aircraft selected and to reselect the correct aircraft. How do I open the configurator from windows so that I may select a different model? My apoligises if this info is in the notes and I have somehow missed it. Roman, are you there mate? I really thought this problem was solved. It may be, and you have a previous version. In any case can you try 1 or both of the following fix tries? If it works can you then give me some simple information? 1st try - On any of the created shortcuts to the configurator.exe ( not the .exe itself ) located in the start menu and/or desktop, right click and select properties. In the properties window select the "Shortcut" tab. Down towards the bottom in the "Run" dropdown select the "Maximized" setting, then click apply. Use that same shortcut to start the program. If this works follow the same procedures for any other shortcuts that you may use. Only do this procedure if the 1st one didn't work. Note - you will need to have "show hidden files / folders" checked in windows explorer. 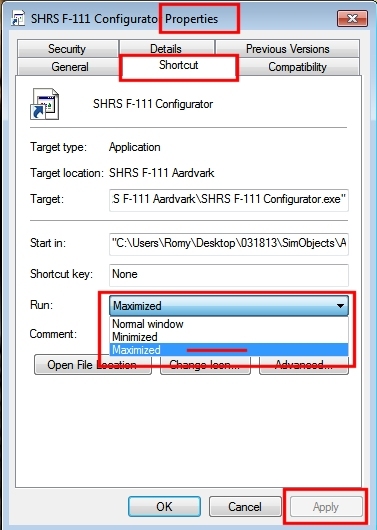 Navigate to (WIN7) C:\Users\USER NAME\AppData\Local\ and find the SHRS folder. Delete the SHRS folder. Restart the program. It should now show. Working or not working can you please reply with your operating system and the complete version of the configurator? IE 2.0.0.37277 as shown in the splash screen or about box. While writing this and testing my newest version compared to the newest released, the problem still shows itself :-( It happens when the program is closed while minimized. I had it coded for multi-monitor users so the program would open up in the the last monitor used, well, when minimized non of the monitors are used :-( . Going to have to take that feature out straight away, but it will not be available until the next release. I hope the fix will help for now and.. I really do apologize for requesting you as a "Guinea Pig"
1st option fixed the problem. Operating system - Win 7, 32 bit. Thanks again for your help. Absolutely love the product.